May is the month to get outdoor in NY! And what a better opportunity to discover the different neighborhoods of the city than the Jane’s walks?! This event organized by MAS offered New-Yorkers and curious travelers alike hundreds of free tours around the city. I made the best out of it and enjoyed 4 of them. Depending on the tour leader, each walk was a very unique experience, very different from one another. With Save our Seaport, it is not one but four tour leaders to learn from! The beginning is some how chaotic, but each leader eventually finds his/her way, giving his/her point of view, sharing knowledge from his/her specialty and points of interest. This tour was the more involved politically speaking. It is really a Jane’s walk, not only about the local history and landmarks but also about the fights led by the community to protect a lively and valuable water shore. We saw the South Street Seaport Museum, the nicely paved (belgian blocks) Water and Fulton streets, the hotel where first immigrants landed before Ellis Island complex was created, the great Imagination Playground designed by Rockwell, offered to the city by a generous fortune but currently closed because too expensive to maintain. 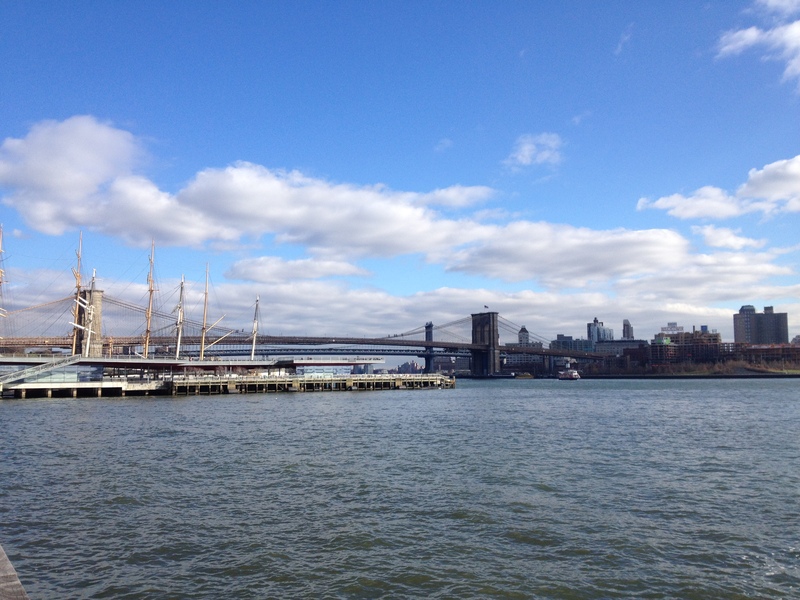 Piers 17 and 15, and the Manhattan bridge, seen from further South. 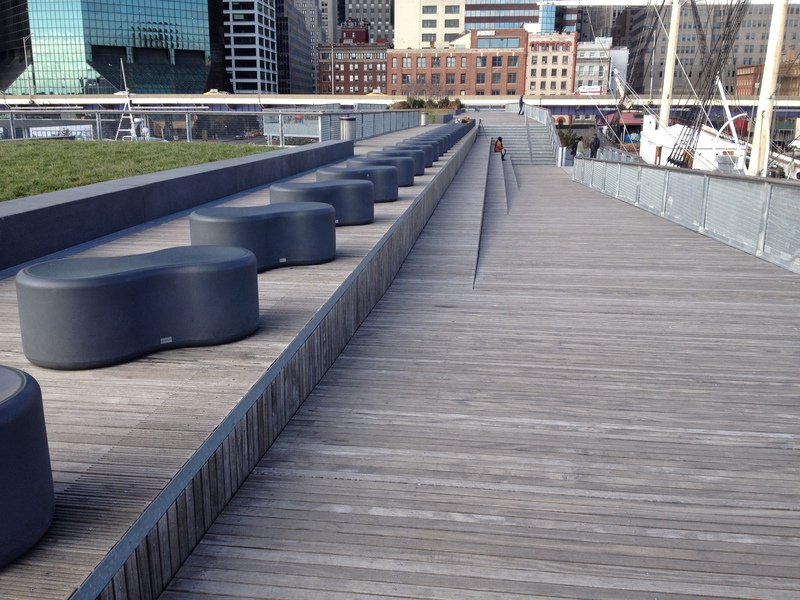 The pier 17, while maintained opened to the public is a private property. This floating park offers different sitting areas, a boardwalk, fresh lawns, and great view points to the river and to the skyline. I personally appreciate this design by SHoP but for the tour leaders, it does not comply to the first mission of a pier to be able to accost ships, and as a direct access to the river, it should have stayed public property. The watershores and access to the river are part of the common good and should be reclaimed as such. Save our seaport seems disappointed by/angry at the city about those unclear private-public boundaries. They tell us various shenanigans where, for financial excuses, public heritage has been giving away bit by bit. But this is why they teamed up. It is up to each citizen to reclaim the right of public property. It is by getting involved that we can influence public affairs. From the pier 17, view on the pier 15 and its historic ships, an extension of the South Street Seaport Museum. That was the main idea of the tour. But let’s get back to it. We saw the public pier 15, and its historic ships; the fish market, left derelict and slowly falling apart; the old brick façades of South Street, eaten alive by the noisy FDR Drive way; the before flood canal and now asphalted plaza of Peck Slip; the cute local shops, bars and restaurants of Water Street; to finish with the treat of glimpsing inside a renovated building rear yard, where old and new beautifully mingle. We talked about hurricane Sandy, doing much damage in the area. But the community showed multual help towards local businesses and inhabitants to save what they could from the waters. This neighborhood really has its jewellery. Between bricks and steel, time polished pavers and salty ropes, in a rusty port language, the neighborhood tells us the story of an early NY welcoming the best from the river and eventually the ocean. This tour is architectural. The tour leader looks like he knows about his subject, I guess he has read quite a bit about it. I didn’t know much about iron cast buildings, and now I do! First things first, what is cast iron? It is a process where a model of a beam or a column is covered with sand, which is compacted very densely. Then the sand becomes the cast into which liquid iron is poured. These structural components were then used to build entire façades, enabling large openings, impossible with brick or stone façades. Cast iron is used on the façade only, it is not structural. You can recognize this material because, unlike steel, it rusts as soon as its paint starts to crackle. Cast iron buildings often present these black/rusty stains along its beams or at column feet. 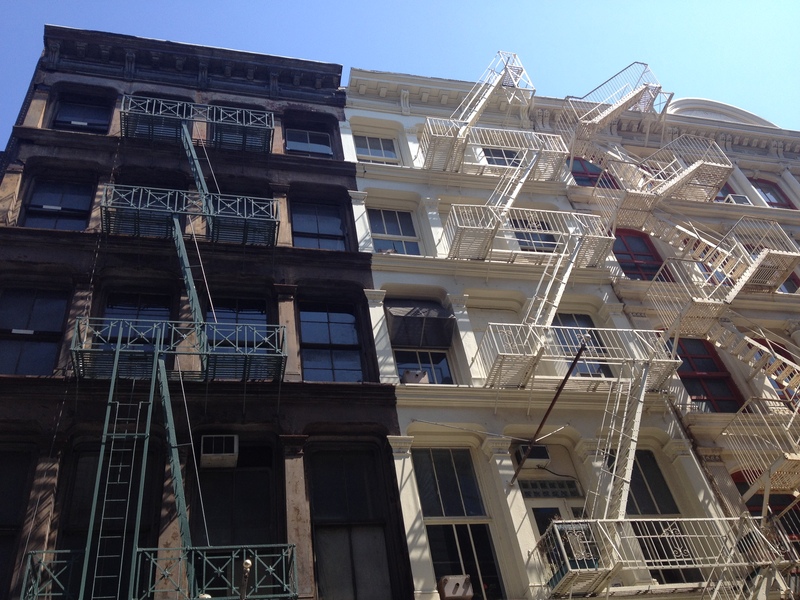 Cast iron buildings became very popular between 1850 and 1870 and Soho is full of its best examples. Large openings were just perfect for the storefronts of this commercial area. The imitation of greek columns in cast iron facades is the face of an on-going discussion at this period: classical architecture attracted all admiration, some citing its perfect proportions, forms and ornements, which are to imitate as closely as possible; some arguing it is to admire for the values it represents. Cast-iron could have permitted any form at all but the favors for ancient architectural typology took it over. Here comes the professional. No multi-leaders, no passionate amateurs, Jason leads tours for a living! He led us all the way down Broadway, from Houston Street to Fulton Street. 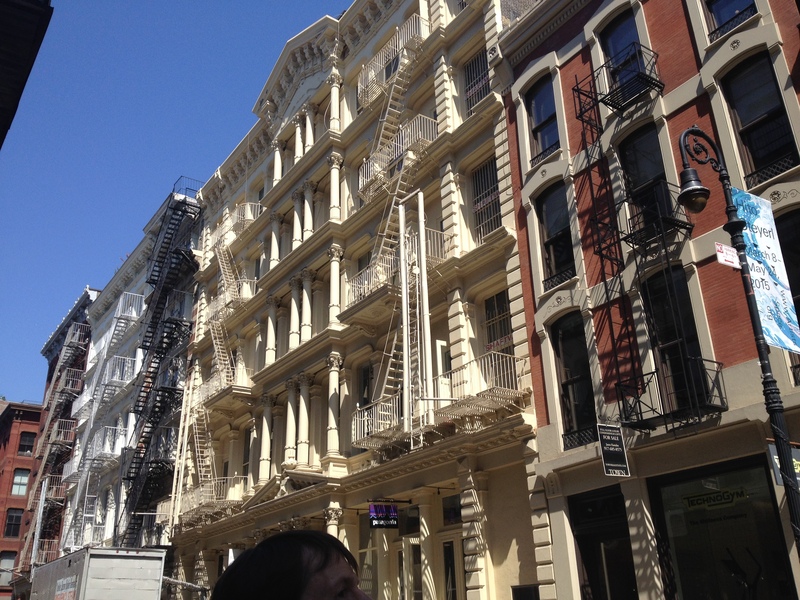 To introduce Soho, he starts with telling how life was here in the early 1850’s: various shops during the day, brothels and theaters at night, Soho was the heartbeat of Manhattan. We imagined how was life in the formerly Niblo’s theater, Metropolitan hotel, and St Nicholas hotel. John Jacob Astor is the personality to remember as the businessman who developed a lot of luxury buildings in the area. As for design, the local architect to remember is John Snook. 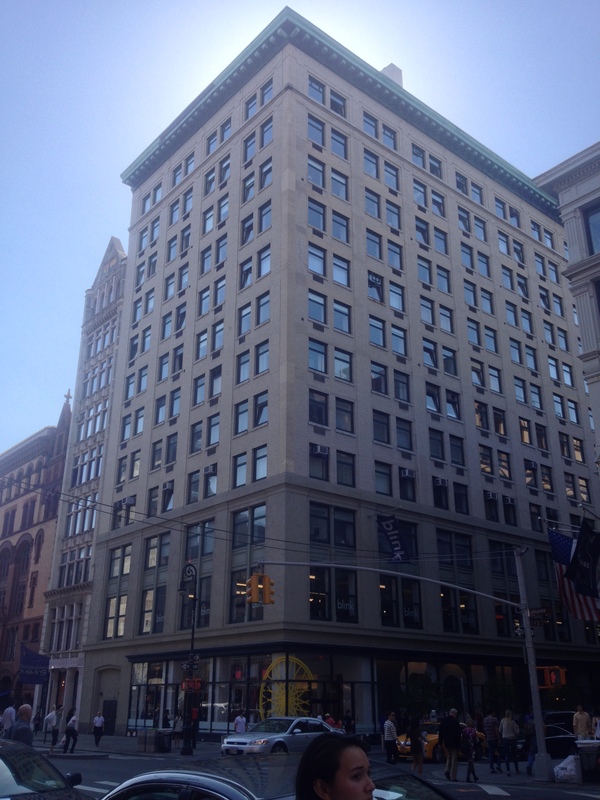 We passed by the Haughwout building (see below), famous for its presentation of the first commercial Otis elevator. We talked about the Draft Riots of 1863, which caused much damage. Arriving at Canal Street, we learnt that the street could also have been called Ditch Street, as it served as a sewage drain line. Did you know that the name Manhattan comes from native language “Mannahatta”, meaning “land of many hills”? We then talked about the Appleton building and stopped at the Federal Plaza, where an African burial ground was discovered in 1992. There is now a museum about it. 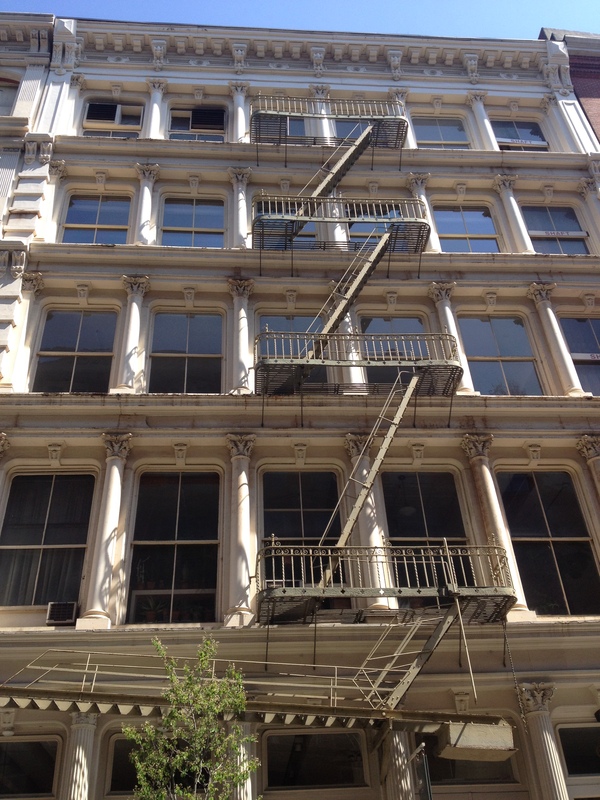 We admired the building at 280 Broadway, also known as the Marble palace, built in 1846 and one of the oldest buildings of the city. It housed the Department Store and later the Sun Publishers. We then learnt more about the 5 points mafia and corruption. As for the Woolworth building, it opened in 1913. With the star singer Jenny Lind, we finished the visit at the Astor house hotel (see below), facing the Barnum museum. Here again, the tour leader is a wise man from who there is a lot to learn. To keep an audience following you around more than an hour (the previous Broadway tour took 2 hours! ), I guess you have a lot of information to convey! The steel rail was slightly modified to function as a beam to support the building, housing the Cooper Union, free (!!!) school of architecture, art and engineering. It is in its Great Hall that Abraham Lincoln did his memorable speech for the abolition of slavery in 1860. This is where started the design collection of the Cooper Hewitt – after a brief sitting at the Smithsonian – by Cooper’s granddaughter Hewitt. Financial problems led to the first admission fees last year, and the sell of different real estate properties. We then approached the crucial subject of transportation. Imagine the cacophony of horse carriages going chaotically up and down Astor Place with no lights. Then rails appear, soon followed by the elevated subway (1879). It was first functioning with steam engines, and then with electrical ones. Cooper’s son-in-law was the one who gathered private and public funding to open the first lines of the subway that we know today. 28 stations opened in 1 day in 1904. Back to where we are. Look around. The Cooper tower, and its glassy undulated façade, caused great oppositions when it was built. The big building across the street, now a K-Mart store, was the annex of 80store, formerly sitting next door but burnt down. The area was pretty fancy, namely with luxury hotels, an opera, private men clubs, and so on. 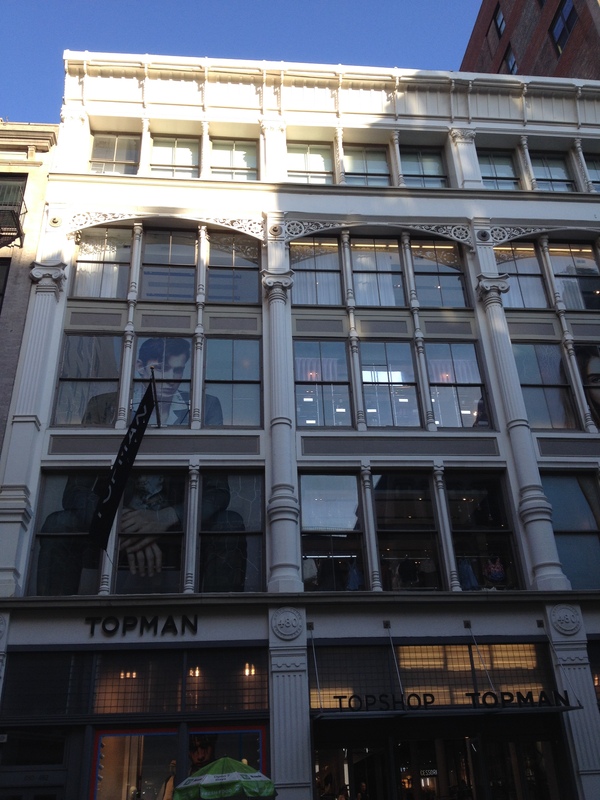 It is on Astor Place that the police opened fire on protesters in 1849. We then walked to the now Public Theater. The pleasure Vauxhall Garden that was here in 1804 became Lafayette Street. The remnants from La Grange terrace across the street is one of the oldest buildings of the city. Astor built a public library as a donation to the city, building that became an Hebrew immigrant aid center, and then hosted the Shakespeare festival in 1965, to finally become the Public Theater. See the Archtober tour of the building to learn more about it. 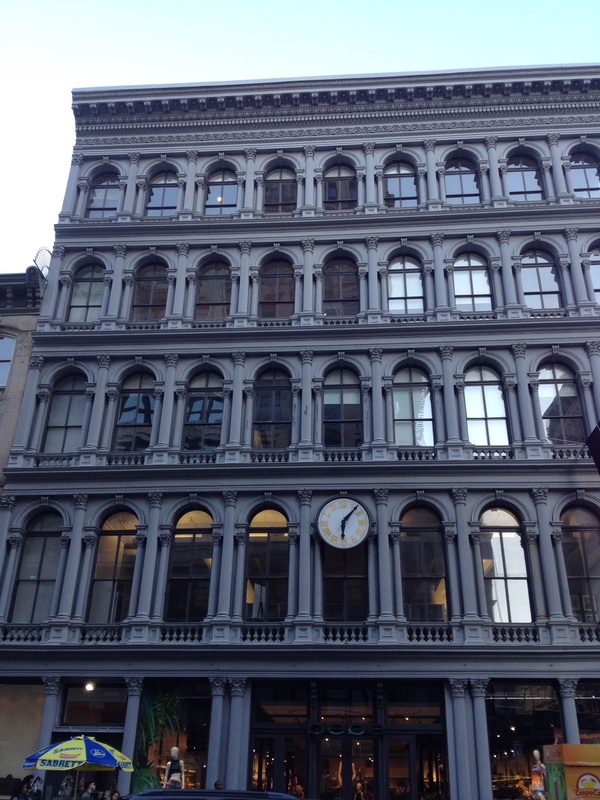 Going down Lafayette Street, we stopped in front of the De Vinne press building (see below), which is all in masonry. At the time it was built, there were only big town houses in the area. The building across the street, primarily for the Brooklyn silk industry (see below), was rehabilitated into triplexes and duplexes by Beyer Blinder Belle architects. Movie and rock stars lived in these spacious units. 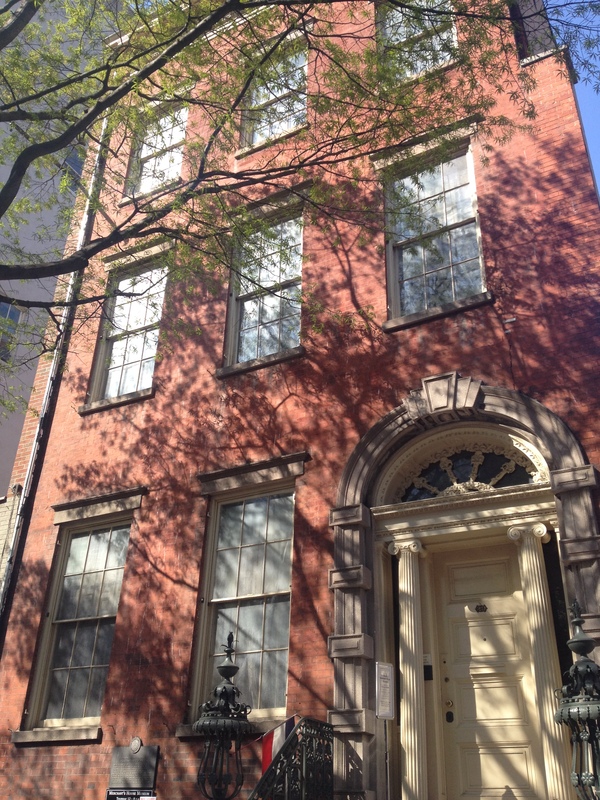 On East 4th st, we stopped in front of the Merchant’s house (see below), which both exterior and interior are landmarked. At the corner, we admire how the gigantic Cooper hotel incorporate the tiny old brick house on Broadway and use it as an entry. The old Amy Jones, fighting to keep her house standing, still lives here! 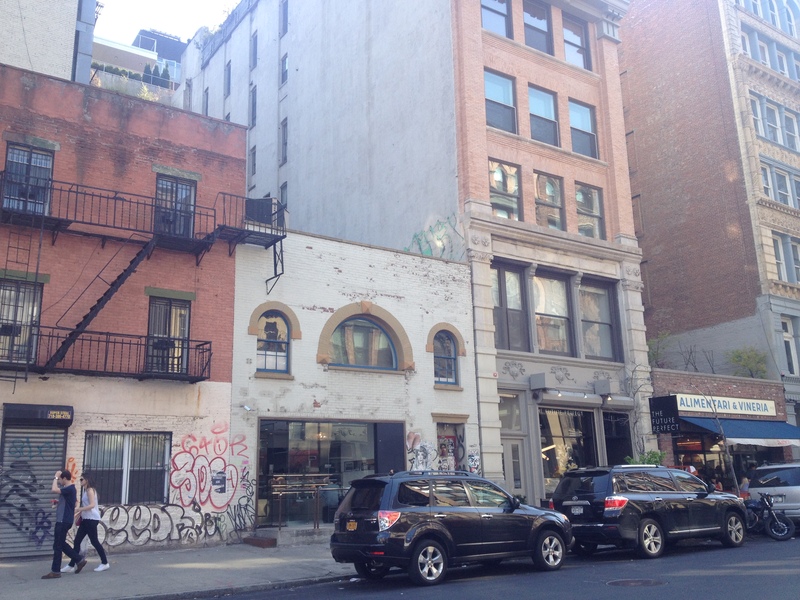 We imagined the former 5 Stocks Café where Thelonious Monk had his 1st long term contract. As for Great Jones Street, it was named after Mr Jones who gave the property on which the street is sitting to the city, on the condition that it was named after him. But because there was already a Jones Street in the West Village, the street was named Great Jones Street. Andy Warhol lived and Basquia lived and OD’ed in the arched window house (see below) standing in this street. The tour finished here for me, but kept going for who knows how long, as this neighborhood is so interesting historically and the tour leader is full of great stories to tell! All in all, this week-end was as sunny as instructive! What is there to say except a big THANK YOU to MAS and to the tour leaders who shared so much! MAS is leading tours all year long but for Jane’s walks, let’s meet again next year!